Opisthocomidae is a group of birds, the only named family within the order Opisthocomiformes. 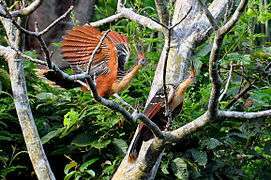 The only living representative is the hoatzin (Opisthocomus hoazin) which lives in the Amazon and the Orinoco delta in South America. Several fossil species have been identified, including one from Africa and one from Europe. Based on the work of Mayr & De Pietri 2014. Genus ?†Foro Olson 1992 (mid-Eocene, USA) - cuculiform? 1 2 Gerald Mayr and Vanesa L. De Pietri (2014). "Earliest and first Northern Hemispheric hoatzin fossils substantiate Old World origin of a "Neotropic endemic"". Naturwissenschaften. in press. doi:10.1007/s00114-014-1144-8. ↑ Mikko's Phylogeny Archive Haaramo, Mikko (2007). "Primitive Land-bird Assemblage". Retrieved 30 December 2015.